“Know your audience” – that’s one of the most oft-repeated mantras for marketers, and one that works for a marketer in basically any industry. So to appeal to male consumers seeking to make their next tech-related buy, researchers working on behalf of Microsoft Canada and Omnicom Group polled 1,650 men and 650 women across Canada. They surveyed the men in French and English, asking them about their roles in their households and families, how often they make decisions on what to buy, their level of satisfaction with their careers, and how much technology is a part of their social lives. Some of the most interesting finds? 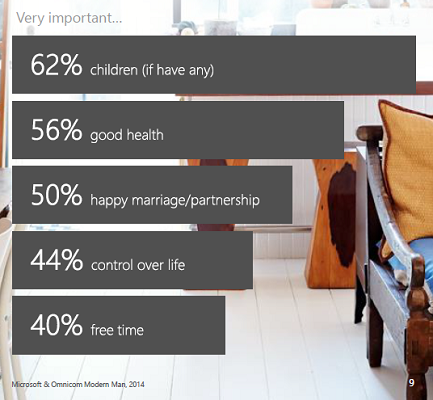 A strong family life and good health were the top priorities for many of these respondents. Sixty-two per cent said their children took top shelf in their lives, if they had any. Another 56 per cent said maintaining their health was one of their main goals, followed by 50 per cent saying a happy marriage or relationship. Forty-four per cent said they wanted control over their lives, while 40 per cent placed their free time above most of their other priorities in life. (Image: Microsoft Canada and Omnicom Group). What may be especially interesting to marketers is the finding that Canadian men are pretty active in making household buys. As 23 per cent of men live alone (and that number is higher among men in their 20s and 30s), obviously they have all the purchasing power. But 52 per cent of men who live with at least one other person report they also have a lot of responsibility when it comes to making decisions for the home, and 88 per cent of men with that level of responsibility said they like it that way. When it comes to buying goods for the home, about 81 per cent have at least some responsibility for buying the TV channel and media subscriptions, but 89 per cent wield some say-so in buying small electronics and major electronics. These men also want to make these decisions responsibly. About 69 per cent said they do research online before making any purchases of large home electronics, checking out retailer websites, brand websites, consumer reviewer and opinion sites, as well as expert sites. A smaller number also turn to social media, blogs, and news websites. Top sources for online research. (Image: Microsoft Canada and Omnicom Group). And once men do get into a store, they like to be digitally engaged and look up the specs behind the purchases they’re making. For example, 45 per cent take photos of products in-store, while about half will look up product information online and will compare pricing. For marketers working in consumer tech, what may be most interesting is that men seem much more engaged with technology than women. In this survey, 34 per cent of male respondents said they were very interested in tech, compared to 14 per cent of female respondents. Once the responses were broken down by generation, half of men in their 20s said they had a high level of interest in tech. In fact, a quarter of all male respondents said they considered themselves early adopters of new technologies, while two-thirds said they acted as technology guides to older family members. Another 35 per cent said people would ask them what kinds of technology to buy. For marketers seeking to reach out to these men, the researchers involved in this survey named a number of places where they can connect with this demographic. Some of the best places? Where men spend their free time. For the younger set, that may mean digital technologies and in gaming, but for many men, this includes networking, e-commerce, news and sports websites. 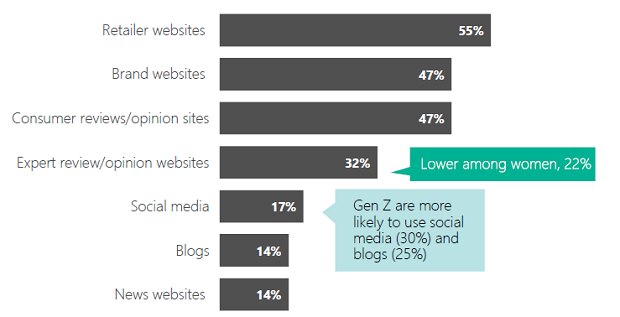 Brands’ websites, forums, and blogs are also good hotspots. For more on this report, head over to Microsoft’s blog.